Eagerly-awaited they may have been, but the annual release of accounts for Blackpool Football Club Ltd and Segesta Ltd (the properties side of the club) proved to be a much more low-key affair this time around. Absent from the contents was any mention of huge director remuneration like last year, but if one scratches beneath the surface, there remains a story to be told. The major revelation last time around was the news that Owen Oyston was paid a director’s salary of £11m in the same season as Blackpool were relegated from the Premier League. The official party line from the club was that this move was done to minimise the club’s tax burden, although this claim appeared to hold little water under even the slightest bit of scrutiny. In the 10/11 accounts, this director remuneration was shown as falling due to Zabaxe Ltd within one year. As expected, the 11/12 accounts show that this payment to Zabaxe has gone through. Interestingly however, the most recent available accounts for Zabaxe Ltd, who have a different financial year end – December instead of May – did not make any mention of the £11m. Due to the size of the company, Zabaxe do not have to have their annual accounts audited, but it seems an oversight that their accounts for year ending December 2011 did not include the £11m as either paid or falling due. Nonetheless, director remuneration fell from £11,067,554 in 2011 to £117,599 in 2012, with the highest paid director netting £65,067. The other notable discovery last time around was the buy-back of the Travelodge land, which Segesta sold to Owen Oyston for £650,000 before agreeing a deal to buy it back for £6.5m with the influx of the Premier League money. An initial £4,899,000 was paid in 10/11, with the balance to be paid during 11/12. As it happens, Segesta paid an additional £1,926,000 for the land, bringing the total paid to £6,825,000 – an extra £325,000 on top of the agreed price that was disclosed in the 2011 accounts. Turnover for the 11/12 accounting period was broadly in line with expectations, based on parachute payments, the Championship television deal and estimating the various other revenue streams. Unusually, Blackpool Football Club Ltd provided a breakdown of the turnover – this is common practice amongst most other football clubs but in the past the club have often just posted the headline turnover figure. Turnover from season tickets and gate receipts combined actually increased marginally from £5.30m to £5.33m despite relegation from the Premier League, although this was helped by an extra four home league games and a better performance in the FA Cup. The biggest drop in revenue was naturally in television rights, although parachute payments help reduce that drop-off. Other revenue streams also fell including sponsorship (down 39%), merchandise (down 32%) and programme sales (down 34%). Curiously sales of food and drink went up by 18%, although this is probably explained by a full season’s use of The Seasider venue built into the South Stand, which had only opened in February of the previous season. The overall drop in turnover was just over 44%, but at £28.8m still vastly increased on pre-Premier League levels which never rose above £10m. The first thing to mention here is what a mess the club have made of their accounts with regards to wages. There is a major discrepancy between the wage costs in the accounts for BFC Ltd and Segesta Ltd. Segesta state that all wage costs, including social security and pension costs total £12.35m, where these costs total £13.58m in the BFC Ltd accounts with just wages alone being stated as £12.35m. This is a glaring error in the accounts and an embarrassing oversight for both the club accountant and the auditors A I Cherry. Looking into this matter further to try and ascertain which accounts are wrong shows it is likely to be the BFC Ltd accounts that are inaccurate. Not only are the 2012 figures wrong, but the latest BFC Ltd accounts have also produced an identical error for the 2011 wage bill. Therefore, we can now calculate that the actual wage bill, minus social security and pension costs, should be taken from the Segesta accounts with a figure of £11.12m. Using this headline figure, the record will show that the club’s salary costs fell by an incredible 52%, although in Blackpool’s case this doesn’t tell even half of the story. The 2011 costs, of course, included the £11m director salary paid to Owen Oyston – with director pay stripped out, the fall is a rather more modest 9.6%. Digging a little deeper it can be seen that of the £11.12m wage costs for 2012, the Director’s Report mentions that the football-related wages made up £10.6m. This leaves £520,000 for administrative and catering staff and at this point the accounts cause some confusion. Despite relegation to the Championship, the number of admin staff rose sharply from 27 to 47 – one has to wonder who these members of staff are. Additionally, how does the wage bill compare to divisional rivals? In terms of how Blackpool’s wage bill compares to the rest of the Championship for the 11/12 season, the chart below displays this information from clubs who have so far provided their accounts for this period. There are a few who haven’t – mainly clubs with a June financial year end, as opposed to the more industry standard May. 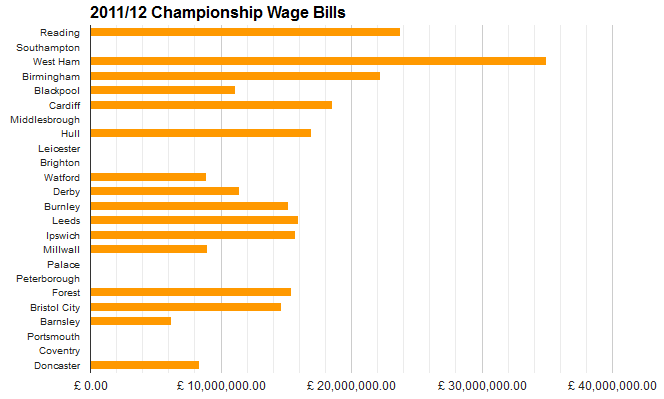 11/12 Championship wage bills. Where clubs haven’t yet filed information, graph is blank. Of the 15 other clubs for whom the information is available, only 4 had lower wage bills, with 11 in excess of what Blackpool paid. Therefore despite a relatively high wage budget by the standards of previous Blackpool campaigns in the 2nd tier, Ian Holloway and his team were still able to punch significantly above their weight in reaching the play-off final at Wembley. It’s at this point where the accounts get really interesting, and tell a more in-depth story of the journey of the Premier League money. The profit and loss account – glaring errors excepted – throws up few major concerns. However when the balance sheet is examined closely, the picture is a little more unsettling. Although it mainly went under the radar last time due to the big £11m salary revelation, an even larger sum of £11.5m left BFC Ltd in the form of a loan to the properties company Segesta Ltd in 2011. It is believed this sum was used to fund stadium construction and the re-acquisition of the Travelodge land. In 2012, around a further £4m was loaned from BFC Ltd to Segesta Ltd. It seems that this money has been used for the final settlement on the Travelodge deal (£325,000 more than the previously agreed figure, remember), as well as further work on the stadium – presumably the South West Corner, hotel and restaurant. Elsewhere there were further loans in turn from Segesta Ltd to Oyston-owned companies – Oyston Estates Ltd, Oystons Ltd, Lancashire Magazine Ltd, Yorkshire Ridings Magazine Ltd, Segesta Properties Ltd and Denwis Ltd (almost all of which are loss-making) – which now total £923,400, up from £535,900 in 2011. It should be noted that the loans to both Segesta Ltd and the various Oyston-backed companies are unsecured, interest-free and repayable on demand. What is worth considering at this point is just how the football club will see this money again, and the ability of these companies to repay the loans. The outstanding loan from BFC Ltd to Segesta is of most concern, given it currently stands at in excess of £15.5m and Segesta’s 2012 turnover was a measly £338,616. After costs, admin expenses and depreciation, Segesta alone actually made a loss of £474,394. Quite how it can ever be expected to repay the football club in excess of £15m is anybody’s guess. Other notable items include fresh loans to Segesta from both Owen Oyston and Zabaxe Ltd. Understanding the necessity of these loans is hard to fathom, especially when Segesta is in turn lending money to other Oyston-backed companies. It paints an increasingly confusing picture as to why the club needs new loans with a healthy cash-at-bank position and it has exposure itself to other Oyston vehicles. Additionally, there are more substantial payments to Oyston-owned project management companies Promenade Developers Ltd, Promenade Construction Ltd and Promenade Interiors Ltd.
Aside from the Oyston family, the other main interest in BFC Ltd is held by Latvian investor Valeri Belokon. His exposure for the funding of the South Stand stood in 2011 at £7.45m, with none of his debts being paid off while Blackpool were in the Premier League. There are two separate loans, one on behalf of his daughter Vlada and the other through his company VB Football Assets Ltd, and the loans are to be repaid with revenue from the South and South West corner stands, less any associated costs. As already discussed, the turnover of Segesta, who as the stadium owner collects any revenue from the South and South West corner stands, is minimal at best. As such, although part of the Belokon loan was repaid in 2012, the outstanding debt still remains high at £7,268,168. At this rate of repayment it will take 41 years for the loan to be paid off. Is this a fair way to repay a man who injected the money necessary to prevent relegation to League Two in 2005/06; who injected the money necessary to win promotion in 2006/07; who injected the money necessary to build the South Stand without waiting for “pre-lets”; who injected the money to sign Charlie Adam and help Blackpool reach the top flight of English football for the first time since 1971? Is this fair? Meanwhile, the Oyston family cleared all but £820,466 of their debt during Blackpool’s season in the Premier League, while also rewarding Owen Oyston with an £11m salary and making a more than 10-fold profit on flipping the Travelodge land at the club’s expense. Is this fair? Now, the public silence from the Belokon camp has been defeaning, but do you really think it will be seen as an equitable deal in Riga? In timing that is surely more than a coincidence, the publication of these accounts occured on the same day that a new Latvian director was installed at BFC Ltd. Exactly what roles and responsibilities Kaspars Varpins will take on is unclear, but one suspects that Belokon is keen on keeping a closer eye on the club than he has in the past 18 months or so. On the pitch, the immediate future is a little uncertain as Blackpool could still run the risk of being dragged into a relegation battle, although three points last weekend at Watford alleviated the pressure to some extent. There is also the small matter of the contractual cliff facing the club this summer with the potential for almost a complete turnover of playing staff. The club will hope to build again under new manager Paul Ince, but the footballing outlook is in a state of flux. Off the pitch, what is the outlook? Despite all of the above, is there a glimmer or light, or is the story one of an opportunity spectacularly missed? In terms of revenue over the next couple of years, there is around a further £16m to be paid from parachute payments this season, with around £8m the following two seasons. This gives the club a stable base and one would imagine that even without promotion back to the top flight, the next three sets of accounts should continue to show profits, even if the latter two of the three are reduced in line with the halving of the parachute payments. However, the single most concerning issue in the accounts is how significant portions of these large sums of money are being loaned from the football side to the properties side, with little chance of this debt being paid in the foreseeable future. The recoverability of these loans should be at the top of the agenda. As it is, Segesta will take 41 years simply to repay the Belokon loans at the current rate of repayment, so just when can BFC Ltd hope to recover over double that amount? Of course, the new Blackpool FC Hotel opened after the end of this accounting period and will now be generating revenue, but it remains to be seen if this income will flow back into the football club. Disconcertingly, the major legacy product most supporters wanted to see was the opening of a new training facility to replace the frankly-unacceptable Squires Gate. Yet it was deemed a higher priority to fulfill other projects such as buying back the Travelodge at over 10 times the cost it was sold for. Ultimately, the football club and its owners need to decide what its aims are going to be. Right now, it is mainly acting as a lending house for Oyston-related businesses with little of the money generated being reinvested back into the football club. It was telling that even when commenting on a positive story – the reduction of season ticket prices for the 2013/14 – that Karl Oyston referred to “the company” doing well, reinforcing the notion many have as football being of secondary importance. There are small signs that the club and its owner are beginning to acknowledge past mistakes however, and the aforementioned season ticket offer is surely an olive branch to try and re-build bridges. Failure to act on season ticket prices could easily have led to a huge fall in renewals. Communication has improved slightly too with new information also being released about how the club will tackle the horrendous situation with the pitch. That said, once more these are examples of the club being reactive once more and in future there needs to be a vision for preventing these issues arising in the first place as opposed to fire-fighting due to mismanagement. The financial picture of the club is a complicated one, and while solvent, major concerns remain over whether the Oyston family are doing right by the club or primarily serving their own interests. It is a fluid situation that needs to be monitored over the forthcoming years. The club’s actions this summer could go a long way to revealing the Oystons’ future intentions.